With only sixteen teams remaining in the quest for a state championship, one of the standout contenders in O’Dea welcomed in the Golden Eagles from Ferndale. The Fighting Irish were looking to keep their undefeated record intact, but would need to knock off a tough Northwest squad to move on. Ferndale jumped out to quick lead through some sleight of hand in the backfield. Ben Broselle ripped off a 60 yard run early in the first quarter. The Golden Eagles defense fed off that momentum and contained O’Dea’s playmakers in the early going. FHS grabbed possession back and were facing a 4th and long from the O’Dea 40. Showing no fear, they went for it and Broselle dashed right up the gut to the endzone 14-0. Ferndale had a chance to put themselves up 3 scores and potentially put themselves in a great position to put the Irish in big trouble, but fumbled and O’Dea recovered. 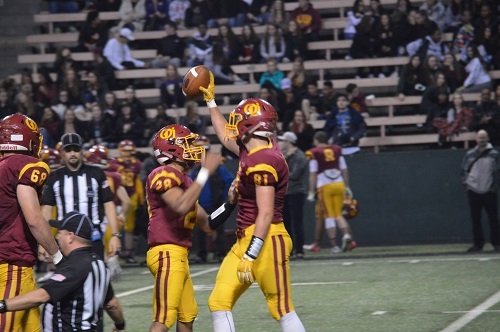 O’Dea took advantage and finally broke through on a drive which Warren King imposed his will with quarterback sneak into the teeth of the Ferndale defense to move the sticks. The offense capped it off with a jump pass to Sam Sanchez who was wide open in the endzone. With 8 seconds remaining and Ferndale punting the ball, Shea Carstens returned the kick 77 yards for a touchdown. Unfortunately, a personal foul negated the score and Ferndale maintained their 14-7 lead heading into halftime. O’Dea responded in a big way. Early in the 3rd frame Jamyn Patu finally found some daylight from the backfield and took the rock 70 yards up the sideline to tie the game up. Moments later, Kyle Hollabaugh returned a fumble for touchdown to give the Irish the lead. Coincidentally, the rain started to fall as Hollabaugh crossed the goal line. Soon to follow: another Patu touchdown run. Then a pitch and catch by King to Quinton Lewis. The ensuing kickoff was fumbled and returned by Parker Dana for a score to put a stamp on the contest. When the dust settled, O’Dea walked away winners 42-21. They will face the Lincoln Abes in the quarterfinal round.